Whispering Pines is located in the heart of Myrtle Beach directly across from the Myrtle Beach Airport. Since its beginning, Whispering Pines has been enjoyed by locals and tourists alike. Its convenient location is easily accessible from many Myrtle Beach hotels and Myrtle Beach attractions. One surprising aspect of Whispering Pines is its serenity. With its location one would assume that the course is surrounded by houses and other development. That is not the case. The course is carved out of 200 acres of towering pines and hardwoods. The operations of Whispering Pines was assumed in 2015 by Atlantic Golf Management who had previously operated TPC Myrtle Beach. Many improvements have been made in the conditioning of the course and more are planned. As you navigate your way down the fairways you will encounter several water hazards as well as strategically placed bunkers. The TifEagle greens are smooth and carry a good pace. The traditional layout is fun for all golfers and can present a challenge for even the most skilled. 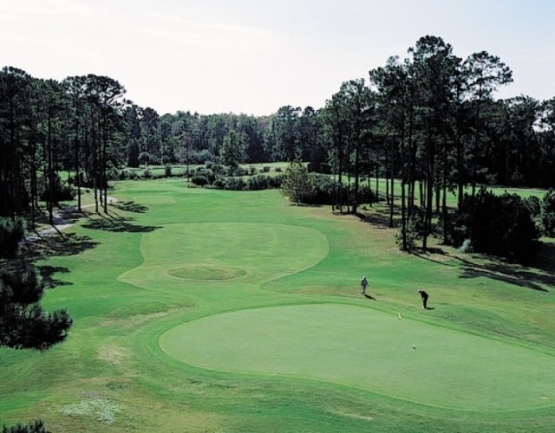 If you haven’t played Whispering Pines you will be pleasantly surprised by this wonderful Myrtle Beach golf course. The Myrtle Beach golf experience is one that you will never forget. Myrtle Beach Golf Authority golf packages offer the very best Myrtle Beach golf value. They will take the hassle out of booking Myrtle Beach tee times as well as providing the very finest Myrtle Beach and North Myrtle Beach accommodations. If you would like to tune up your golf game with a Myrtle Beach golf lesson from a renowned Myrtle Beach golf instructor they can direct you. While visiting be sure to check out some of the Myrtle Beach golf stores such as Golfsmith EXTREME and PGA Tour Superstore. There is so much to see and do and today is the perfect time to book your Myrtle Beach golf package.